Portland’s Old Port District really doesn’t get any better, with endless shops featuring seriously talented local artists, plenty of great eats without or without lobster, and the constant serenade of sea gulls. Until now. 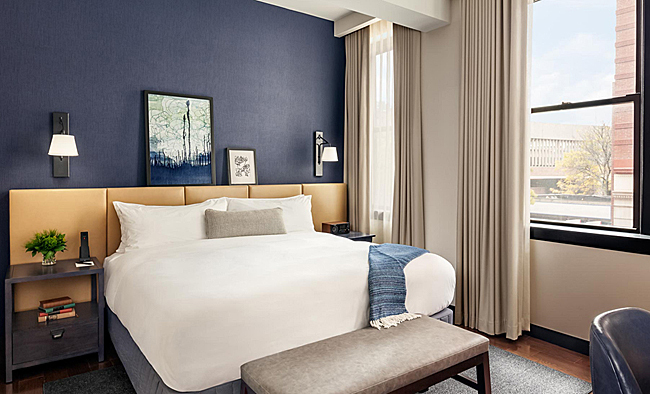 Add to this list a must stay at The Press Hotel, Portland’s new hotel kid on the block – as in letter block – which opened recently and is now in full summer swing. Naturally, we were uber eager to check it out so we checked in. The Press Hotel, a member of Autograph Collection, a who’s who of visually and architecturally unique hotels, is named for former newspaper tenant, Portland Press Herald, who occupied the circa 1923/1947 buildings until 2010. The Herald still prints today from another location, and yes, they have featured many stories on the hotel. Here’s our story on which we focus, and celebrate, the design and its many clever and symbolic features. 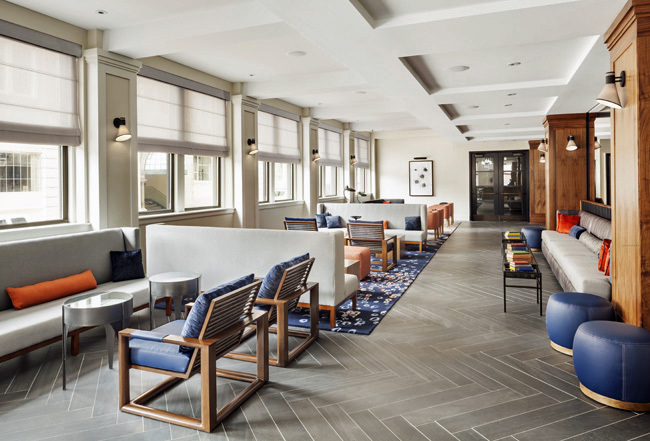 The renovation architecture and interior design of The Press Hotel represents another “Taylor” made project by New York based Stonehill & Taylor. Put another way, a perfect fit for historic Portland. 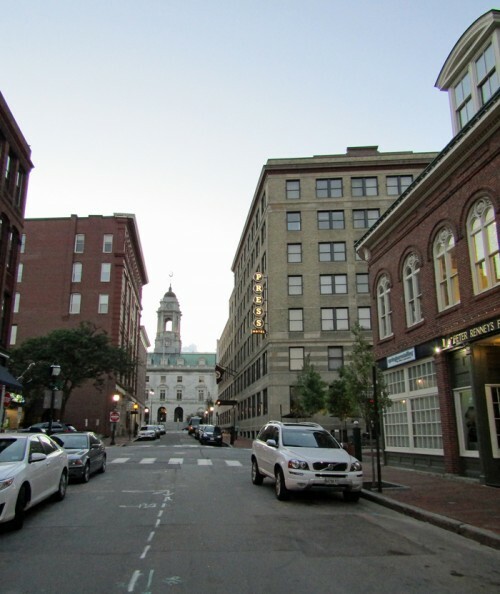 We believe a hotel’s first impression starts at the street, and Portland’s Exchange Street is one spectacular location. 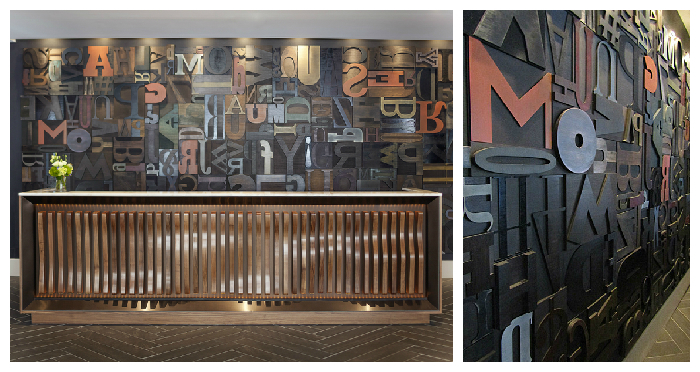 Surrounded by charming historical buildings lining both sides of the street, with City Hall as a focal point, Press Hotel holds its own, with its illuminated typewriter key sign. Although the one-way street prevents the approaching view by car, this is a visual treat for guests and locals on foot. This window wall, equally sparkling both from the entry foyer and the lobby, features a varying wooden grid pattern and a nice nod to history with occasional panes of period reproduction glass. We admit we didn’t figure this out without a gigantic hint from Linda Prescott, Press Hotel’s Director of Marketing, but the offset grid pattern suggests the letterpress boxes that stored the block letters used in printing. The deep blue colors featured throughout the hotel – from the furnishings to the walls to the art – is quite simply the perfect shade of blue. Yes, we all recognize it as the color of ink, but some of us may also remember carbon paper, which was once the only way to duplicate our typewritten works of art or wisdom. Carbon paper is still used today. In either case, know that this was not a quick or random selection from the Pantone deck of colors. It takes quite an effort to get color right, and we think Stonehill & Taylor were spot on, so to speak. The reception desk features curved wooden slats that pay homage to Portland’s shipbuilding history and at least to us, the varying reflections of the sea. 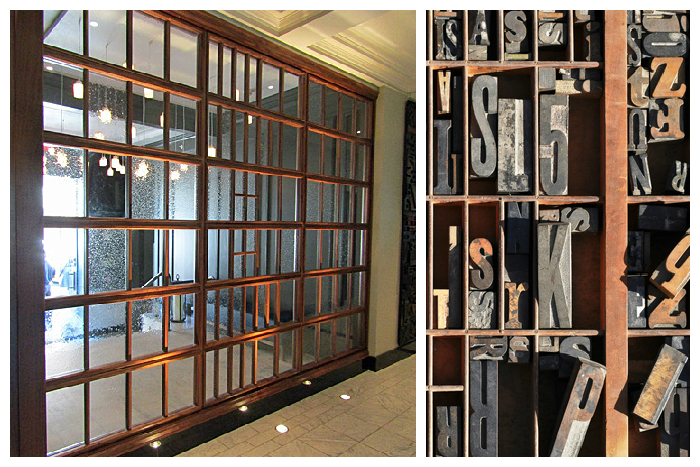 The art wall behind the desk symbolizes the letterpress system used in early printing factories. The depth, character, and creation of this major hotel feature were hand crafted by local artist and master woodworker Matt Hutton. We got a great close-up highlighting its highly textural character. Position yourself virtually anywhere in the lobby and you cannot miss, and should not miss, the great wall of vintage typewriters. Thankfully there are collectors out there who are partial to these very early word processors, and the hotel was able to snag about a hundred of them. 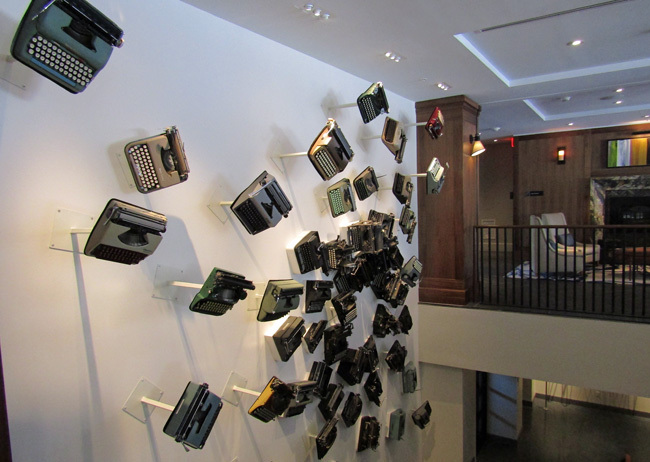 The concept and arrangement of the typewriters were conceived by students at the Maine College of Art. Since the hotel opened, there’s been plenty of due attention paid to the “writing on the wall,” featuring captions and excerpts from past Press Herald stories. We love the regurgitation of letters onto the floor- it’s a great effect while simultaneously declaring an end to the boring hotel hallway. The writing on the wall is one thing, ah but the lighting on the wall is quite another. We love the wall sconces and we think this may be a first in a hotel. The use of a stenciled opening in the bottom of the light fixture to create a glowing image of the guest room number really sold us. Of course, the required conventional room sign is there as well. There are several meeting and event rooms at Press Hotel, located on the first floor and the lower level. Each space has a different vibe – and a different, cool carpet pattern – and each space is flexible for a variety of purposes. 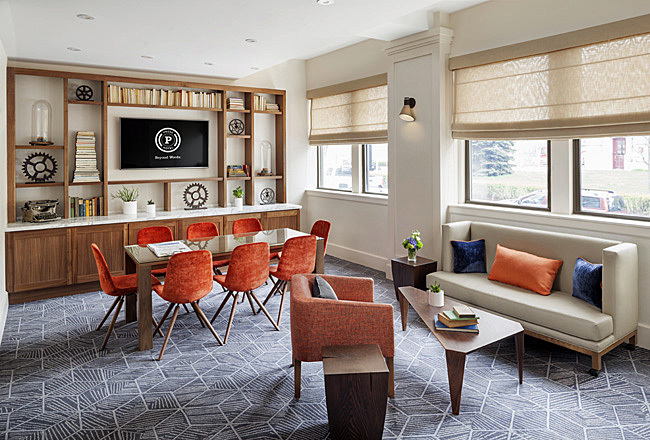 The News Room, shown above, is located off the lobby, with plenty of natural daylight and colorful furnishings to brainstorm the day’s agenda. 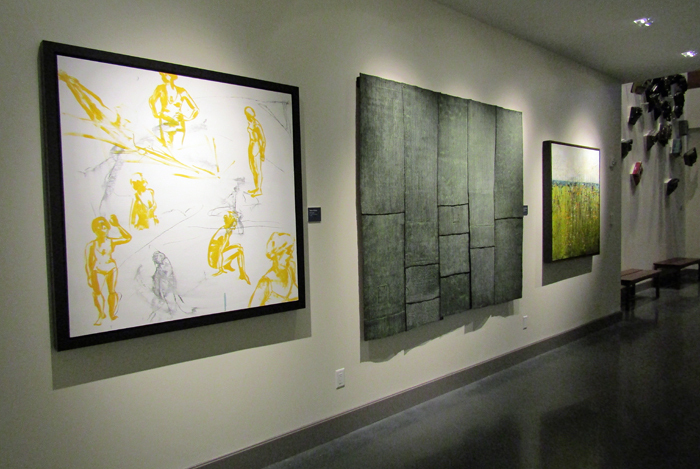 The Press Room, shown below, is located within the art gallery space at the lower level. You’ll be anything but bored in this board room, featuring a bold checker”board” carpet, classic modern leather chairs, and state-of-the-art telecommunication systems. 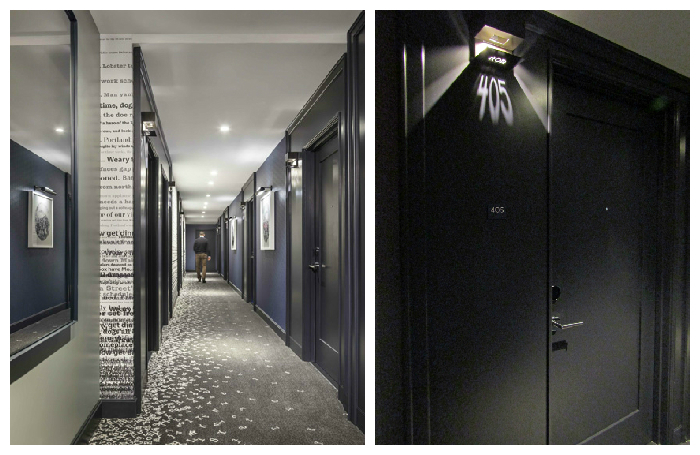 With all the contemporary expressions of the printed word throughout the design of the hotel, it’s also great to see images of real newspaper clippings repurposed as a visual, even useful, detail. The lobby lounge features small, round coffee tables, one shown above, each displaying a different front page newsprint. 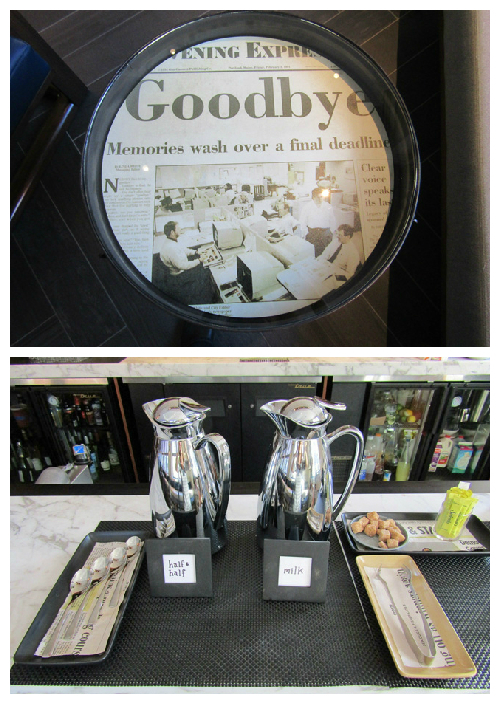 We also noticed the newspaper clipping as napkin concept, displayed on the coffee serving tray in the Inkwell Bar. Somehow we knew the creative minds at Stonehill & Taylor would think outside the box, inside rather, in the design of the elevator cabs. 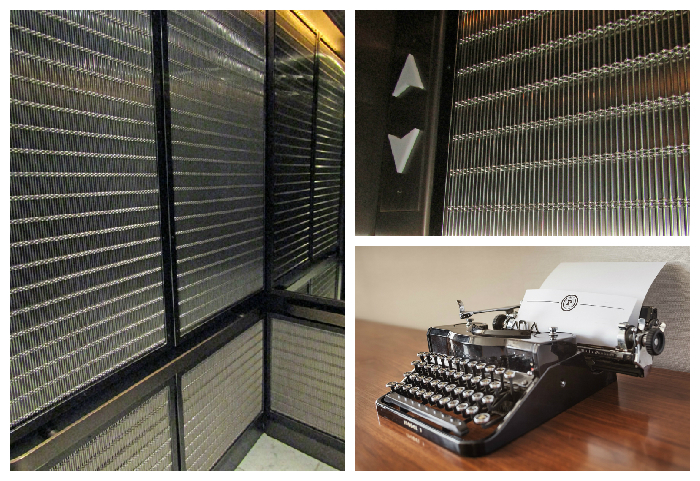 It may have been a stretch to make this connection but we suspected that the wall panels, featuring rows of tiny metal pins, might reference – however abstract – the stems of the typewriter keys. The industrial essence is there whether or not the symbolism is there. 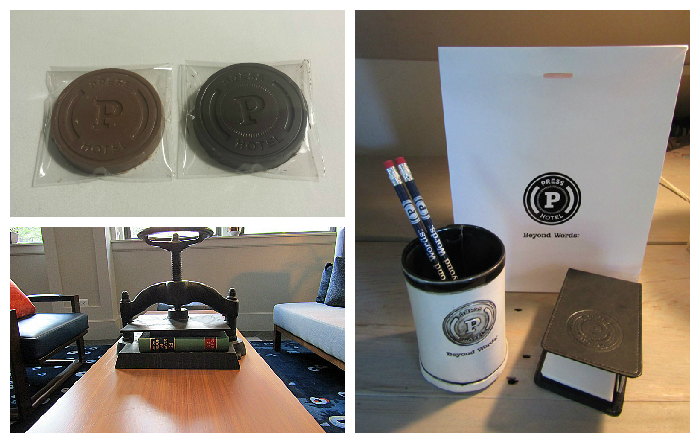 Clever table dressings and artistic amenities fill the hotel, from vintage cast iron book presses in the lobby, to artisan crafted desk accessories (available for purchase,) to Press Hotel imprinted pillow chocolates – our kind of nightcap! Art is king at Press Hotel. Some of it has been especially created for the hotel, while the lower level is transformed into a serious gallery of original works of modern art, flanked by meeting rooms. Some mixing and matching of these spaces can be arranged for social receptions and special events, not the least of which is an auction. Extra! Extra! LEED all about it! 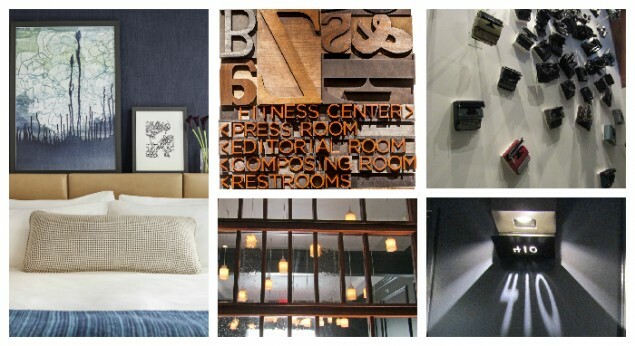 During our stay, Press Hotel was officially notified it has achieved LEED Certification. Now that’s impressive, and our congrats to the entire development team! 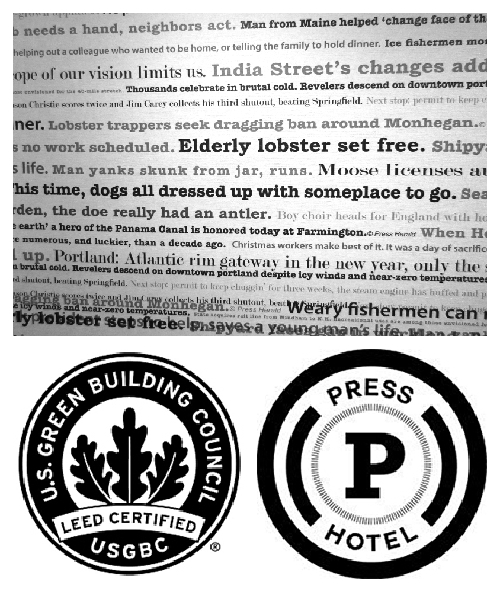 You have to agree the LEED logo looks pretty good along side Press Hotel’s logo.. that should make for a pretty snazzy wall plaque. 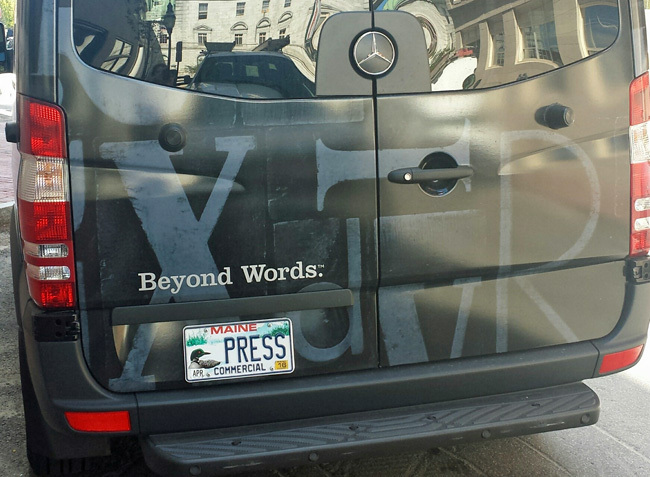 On our departure, we spotted the hotel shuttle van and had to share this image. Beyond words and definitely beyond cool.